I need to be honest; the last thing on my to do list was to ever have anything to do with Homer again. I read (sort of) The Odyssey in 9th grade and The Iliad in 12th and I had more than my fill of it. So when Ensemble Theatre of Cincinnati announced their season and this show was on it, I figuratively rolled my eyes. But as a dedicated theatre advocate, I made plans to go and give it a shot. With all due respect to Mrs. Gwen Cody (who did manage to instill a love in me for To Kill A Mockingbird), I wish I knew just how powerful the source text could be. Thanks to Bruce Cromer, who is spellbinding as “The Poet” in Ensemble Theatre’s production of AN ILIAD, I get it now. This show is timeless and timely. Cromer starts the show with his back to the audience (and I still haven’t figured out how he got on stage so fast and so quietly) and as he slowly turns to face us, you can see the wistfulness in his eyes. This is a man with stories to tell and does he ever tell them. This particular production is one of three solo performances currently on stage in Cincinnati (Antoinette LaVecchia in I LOVED, I LOST, I MADE SPAGHETTI and Christine Dye in SARGE provide the other two, and both are superb by the way). It’s hard to believe that anyone can memorize this many words but its astounding to me, that anyone can recite them with as much passion as Cromer. 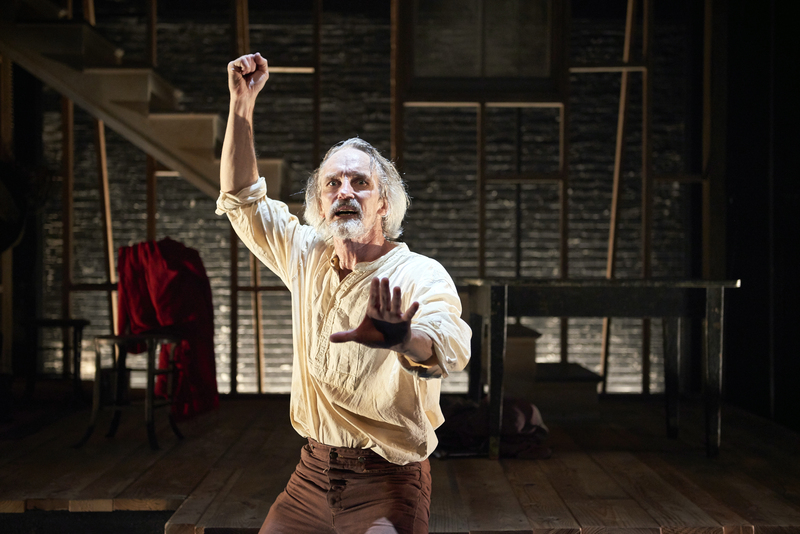 Everyone knows that Bruce Cromer can act; he’s been Ebeneezer Scrooge for years at the Playhouse and has been seen on professional stages all over the region usually to rave reviews. But this role . . I imagine this one allows him to dig as deep as he ever has. It’s as physical as it gets; he bounds across the stage, climbs up ladders, throws himself on the floor, jumps, pounds, gasps, yells, and cries all in 110 minutes of non-stop storytelling. It’s a whirlwind of Greek tragedy, with just enough humor to take the edge off. I love Cromer as Scrooge, I adored his Atticus Finch (at Cincinnati Shakespeare Company), but this Poet will be the one I remember the most. He’s mesmerizing, captivating, and I was enraptured the entire show. Direction of a one man show is a sort of mystery to me; I often wonder how much input an actor like Cromer needs from his director. But you can see the simple touches of Michael Evan Haney throughout this piece. Mostly, though, I assume he provided the support that his actor needs to dig deep into his soul to pull out such a marvelous performance. Brian C. Mehring’s set is perfectly raw, and gives exactly the canvas such a storyteller needs to unravel his tale. The lighting, the sound, the set, the direction all support the star of the show – and make no mistake about it, that star is Bruce Cromer. Ensemble Theatre has once again produced a socially conscious work (in the same vein as last year’s TRIBES and THE MOUNTAINTOP) that makes its point without being preachy. The connections between ancient wars and modern-day conflict is jarring. “Anger is short-lived madness,” said the Roman poet, Horace. From the stage, this “Poet” asks us, “Do you see?” The audience members around me audibly responded with gasps of acknowledgement sure seemed to. You should go watch it, too, so that you also might see. AN ILIAD plays at Ensemble Theatre of Cincinnati through November 2nd. More information, including how you can get tickets, can be found here or by calling the Box Office at 513-421-3555. Agree wholeheartedly! Best performance by an actor in Cincinnati that I have ever seen. Great direction, and sets and lights were superb as well.